Location , private , quiet , safe private parking located outside back door . Very nice apartment with a private parking spot, wifi and more. We really appreciated the tea, sugar and milk! But also the extra towels and the Christmas tree. Instructions for checkin and use were clear. A neat self contained flat, well equipped with a fully functional kitchen. On-site parking, a real bonus in Hereford. A reasonable walk to the city centre (or buses nearby). Hereford has a wide selection of good bars and restaurants, and is ideal for a long weekend. Comfortable beds, good shower, apartment decor good, everything you need as home from home. Good location, 20 minutes to centre of city, 10 minute walk to the bus stop, 10 minute walk to local shops.quiet neighborhood. Carey was really helpful to the runup of our stay. Location was great forgetting around. Apartment was clean and catered for all our needs and more. Ideal for families who have a teenager who needs own space and WiFi!!!! Comfortable apartment with a high standard of furnishing and decoration. A very well stocked kitchen. Beds were super comfortable. High-quality bedding and towels. Kids very impressed with the X-Box and games! Just felt like home the moment we walked in. Very comfortable, and much nicer than having to get two rooms elsewhere as usual. The WiFi and sky was a welcome touch for the evenings. The pin would have been useful though for the sky box. Lock in a great price for Mayflower Coach House by RentMyHouse – rated 9.4 by recent guests! One of our best sellers in Hereford! 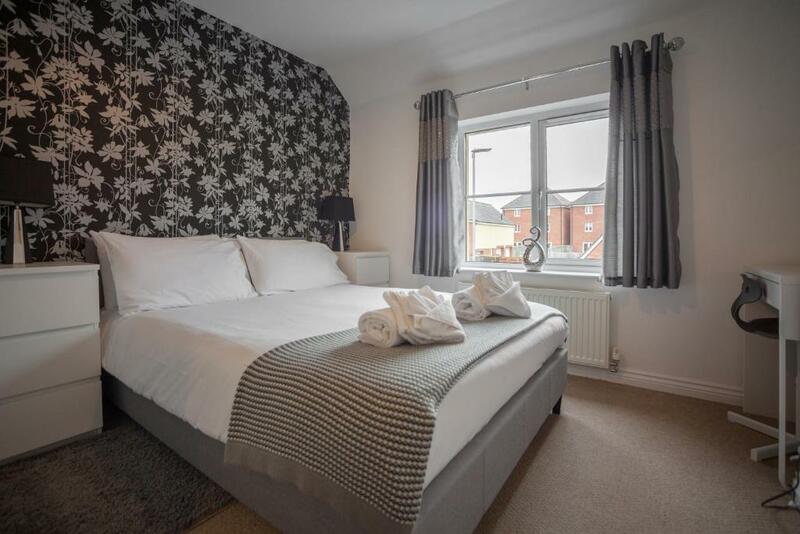 Located in Hereford, this apartment features free private parking and free WiFi is available throughout the property. The unit is fitted with a kitchen. A flat-screen TV and DVD player are provided. There is a private bathroom with a bath. The nearest airport is Bristol Airport, 45 mi from Mayflower Coach House. When would you like to stay at Mayflower Coach House by RentMyHouse? A beautiful, modern detached coach house in a popular location close to local amenities with ideal access to rural countryside and the Cathedral City of Herefordshire. Our coach house is not our home it is purely used for the benefit of our guests and contains brand new furniture throughout for your comfort. There is free wifi and Sky TV. House Rules Mayflower Coach House by RentMyHouse takes special requests – add in the next step! Mayflower Coach House by RentMyHouse accepts these cards and reserves the right to temporarily hold an amount prior to arrival. Value and the settee not comfy . Please put a sponge in the kitchen! A king size bed would have made for a more comfortable stay. Beds were uncomfortable, bouncy and we rolled into each other. Very clean with all the appliances we needed. Maybe a desk fan or similar as it was quite hot, and the way the house is orientated it was difficult to create a breeze through the house. Obviously, no-one can determine the weather, but a fan might make airflow a little easier. Slightly to far out of town, but a great walk through the park, takes 20mins to walk to centre.